The RAP (remove & protect) was designed to remove an unconscious Firefighter….Key features of the RAP make it the most effective tool for any RIT team across the nation. Nothing on the market has the capabilities for this type of operation. The Light weight allows for mobility while locating the victim. Ready for use when deployed. The base is made of a specialty material and rolls open when released. Positioning is made easy with the color coordination RED for the head White for the waist Blue for the bottom. Large “T” handles are designed to be found with a gloved hand and pulled from the keeper. Rated snap hooks & D-ring are the hardwear components used to create the harness systems. 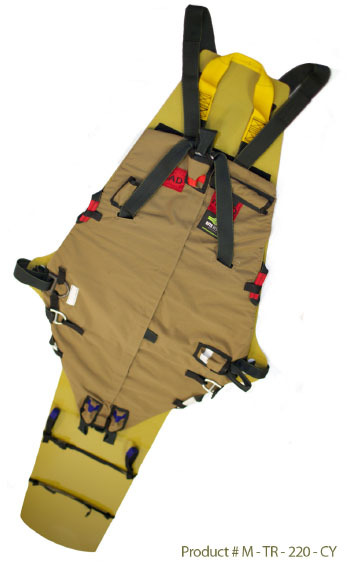 It takes less the 30 seconds to apply a Class III harness in an IDLH when using the Patriot RAP. The The webbing is type VII mil spec Mil-W-4088. The Patriot RAP has been tested by the UL to the NFPA standards 1983/2012 edition passed and exceeded testing criteria. The base platform is also removable, this add's longevity to the device. When the base wears through just put a new base on. On the top of the RAP there are 2 drag handles and a Yellowhoist connection point. The RAP can be Dragged - Carried or Hosted to safety. Line RAP up with head of victim. The simplicity of this device will accomplish many objectives on the fire ground. First and foremost the speed of removing a downed firefighter will be decreased drastically by minutes. This limiting the time exposed to the IDLH and fire conditions. The only time we control as a RIT team, is the time it takes for the removal of the firefighter from the IDLH!!! Next aspect is giving the RIT team an option for removal. There are almost no practical devices for this type of operation. Until now. Very commonly the downed firefighter is almost striped of his gear by the time he is out. The packaging of him in the RAP keeps everything tucked in and reduces his profile for maneuvering around obstacles. And lastly the time it takes to learn how to use the system. The learning curve for the RAP is limited. In a 5 minute session you will have a complete understanding and capability on how to use the RAP. This will help the officers create a more powerful RIT team when called to do the unthinkable.